ASD is poorly understood and often misdiagnosed in South Africa’s impoverished informal settlements. In many cases children with ASD are excluded from mainstream education because they are perceived as rebellious and uncooperative, thereby becoming an outcast and burden to the community. The Children’s disABILITY Training Centre is committed to empowering educators, therapists and parents of children with ASD, intellectual impairment and developmental delay in low socio-economic communities. The success of the Fishbowl Autism Skills Development Programme has inspired us to bring this training to special schools in the informal impoverished settlements around Johannesburg where there is very little access to specialised education. The outreach project involves a dedicated process on the part of CdTC and its team of specialist educators and therapists in assisting schools and training centres to adapt their curriculum in order to target the various areas of developmental delay. In 2014, CdTC trained and assist educators/class assistants at 4 different locations – Alexandra, Vosloorus, Daveyton and Soweto. Altogether 95 educators and 9 class assistants from 11 different schools attended the training. We believe that 1559 learners benefitted from this on-going training and assistance given to the above mentioned. A weekly schedule was established whereby each venue was visited weekly throughout the year, excluding school holidays. These weekly visits consist of training sessions as well as visits to the classrooms and mentoring the educators in aspects in the training they’ve found difficult to implement. We have assisted schools in establishing 5 specific Autistic classes in 2 different schools. The establishment of these classes has made the most profound difference in the lives of the learners on the Autism Spectrum as well as their families. 4 Parent workshops were held at 2 different locations. The parent workshops gave the parents an opportunity to voice their concerns about their children. The workshops also gave parents much needed information about Autism and other disabilities and the management thereof. We encouraged parent to start a parent support group in their area. 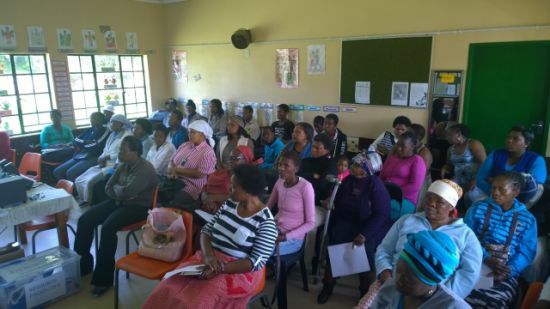 During 2015 training of ECD educators, therapists and practitioners at 4 different locations (Katlehong, Davayton, Soweto and Orange Farm) will take place to meet the diverse needs of learners with disabilities. 4 Parent meetings will take place to support and empower parents at 6 Special Schools located in 2 different informal settlements around Johannesburg.